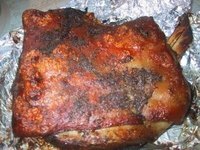 A slow roasted pork shoulder is one of the best tasting and most versatile cuts of meat. It can be braised, smoked, roasted or cut up into stew. This large cut of meat can be difficult to carve. The following steps will help you carve the perfect roasted pork shoulder for a beautiful presentation and slices of the same thickness. Using a very sharp carving knife and fork to hold the meat steady, make a single slice at one end of the pork roast, going all the way down to the bone. Make a second cut on an angle downward to form a wedge, then remove the wedge of meat and set aside onto the platter. Push your fork deep into the roast to hold it steady, and continue making downward cuts on the same angle as your second cut. Your slices should be of even thickness and should still be attached to the bone. Slice until all the way to the end of the bone until you can slice no further. Make one long horizontal cut alongside the bone but under your slices to cut them away from the bone and the rest of the roast. Turn the bone over and repeat this process if possible. For a smaller cut of meat you may just need to trim up the bone removing slices of meat wherever possible. Arrange your slices neatly on a serving platter, and drizzle any leftover juices onto the top of the meat or use them in making gravy. Make each cut slow and sweeping - don't make tiny cuts as this will shred your meat. Use your fork to hold the roast steady. Save the drippings for making delicious gravy.